Mouse lens and cornea development. 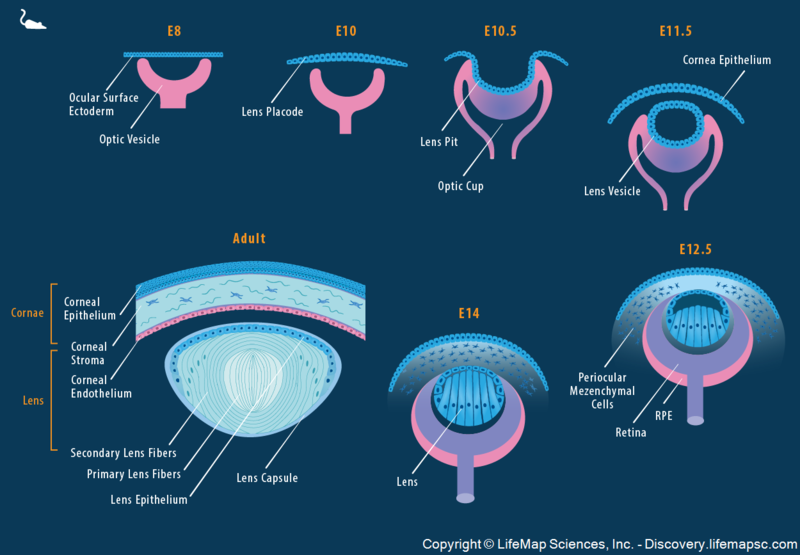 Schematic illustration of mouse lens and cornea development: Lens and corneal epithelium are derived from the ocular surface ectoderm. The optic vesicle (OV) triggers lens development in the overlying ocular surface ectoderm, which undergoes localized thickening to form the lens placode. At E10.5, the lens placode and the optic vesicle simultaneously invaginate to form the lens pit and optic cup, respectively. The lens pit subsequently detaches from the overlying ectoderm, creating a hollow lens vesicle (LV); the overlying surface ectoderm gives rise to the corneal epithelium. The optic cup gives rise to the retina and retinal pigmented epithelium (RPE). At E12.5, neural crest-derived periocular mesenchymal cells migrate into the space between the lens vesicle and corneal epithelium and give rise to the corneal endothelium and stroma. At the same time, the posterior cells of the LV stop dividing and elongate towards the anterior LV to create primary lens fiber cells, while the cells of the anterior LV maintain their proliferative capacity and become lens epithelium. In the adult, the cornea consists of the outermost corneal epithelium, the corneal stroma and the inner corneal endothelium. The lens is comprised of the lens capsule, the lens epithelium and primary and secondary lens fibers.